The Sun is 100 times bigger than the Earth, and the Earth is 4 times bigger than the Moon. The Sun is also 400 times farther from the Earth than the Moon is, which means the Sun and the Moon appear the same size on Earth… and every year or two, the Moon passes directly in front of the Sun, which creates two shadows over the Earth. The first, larger shadow is called the penumbra. This shadow only partially blocks out the Sun, and those inside will only see a partial eclipse. The second, smaller shadow is called the umbral shadow, and those inside will see a complete eclipse of the sun. As the Moon makes its way through space, the umbral shadow sweeps across the surface of Earth, creating the Path of Totality. This map shows the path of totality accross the USA. The Path of Totality is about 70 miles wide and represents the area where the sun will be 100% blocked by the moon. Regardless of how close you are to the Path of Totality, having a pair of Eclipse Glasses will be essential to observe the entire eclipse. The event can take up to three hours from start to finish, but the total eclipse usually only lasts around two to three minutes. 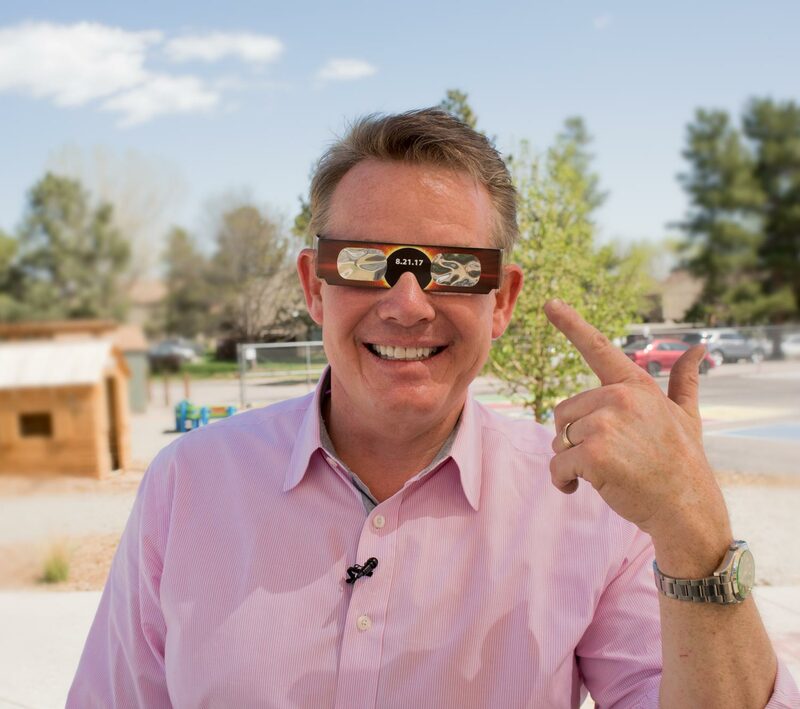 Our Eclipse Glasses block out ultraviolet and infrared rays of light, only allowing enough light in to observe the path of the Moon across the Sun. The only time you can safely observe the eclipse without your glasses on is during the two to three minutes that the total eclipse takes place. Make sure you watch the weather as well, as overcast skies will block your view of this spectacular sight. If the weather doesn’t cooperate with you, be prepared to literally chase the eclipse until the skies clear up. Beyond that, make sure you pack food, water, and sunscreen for before and after totality. Our Solar Eclipse Glasses block the harmful ultraviolet and infrared rays of the light that come from the sun and are essential for viewing the partial phases that procede and follow totality. You can follow the Moon’s progression across the Sun by looking through these glasses every few minutes during the partial phases. Our custom eclipse glasses are manufactured with scratch resistant black polymer material with an optical density of 5 or greater. This ensures that you will have the best viewing experience. They’re also scientifically tested and certified to meet the Standard for ISO 12312-2:2015. *standards for direct sun viewing safety. Our glasses allow you to view the total solar eclipse with absolute confidence in your eye safety. The initial partial phases will last about 90 minutes, but the last 20 minutes before totality you will start to notice that the temperature is dropping and the sky is beginning to look odd. A rapid decrease in the brightness of the sky will alert you and that totality is near. Once the darkness descends, you will know it is safe to take your glasses off and look at the totality. It is extremely important to remember that only during complete totality you might look at the Sun without our Solar Eclipse Glasses. 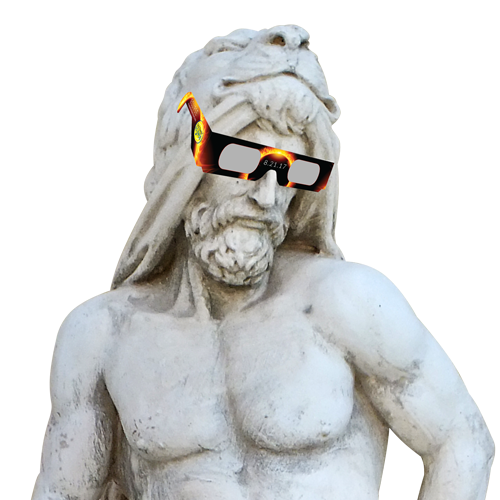 Never look directly at the partial phases of the eclipse without our Solar Eclipse Glasses. Even though the total part of the eclipse will last about 2 minutes, it will seem to go by much faster. Before you know it, the Sun will peek around the Moon again and will be time to put those Solar Eclipse Glasses back on. So when does it begin and end? That depends on where you are. The eclipse occurs in mid-morning in the western US. In the middle of the country, the eclipse happens around noon. Finally, if you’re in the eastern U.S., watch the eclipse in the early afternoon. In ancient times, people thought solar eclipses were a sign of the world coming to its end, and different cultures had their own ways of bringing the Sun back. In China, they would light fires or shoot flaming arrows at the Sun to make it catch fire again. In Europe, India, and Indonesia, people thought the Sun was being swallowed by some celestial monster, like a dragon or lion. They would bang on drums and make tremendous noise to try and scare the monster away. Eclipses were also seen as omens to ancient cultures, and during a war in Turkey, two battling armies took a solar eclipse to be a sign to lay down their weapons and make peace. Over time, people began to try and predict eclipses. By the 1800s, astronomers would travel as far as possible to catch sight of the event. Artists would travel with them to attempt to capture what they saw in a painting, as the camera hadn’t been invented yet. After the invention of the camera in the late 1800s, those who only heard of eclipses could finally believe what they’d been told after seeing pictures of the corona. Einstein used the total eclipse of 1919 to confirm the bending of starlight by gravity as predicted in his general theory of relativity. In 1926, scientists theorized that stars generate their energy from nuclear reactions in the core of the star. This theory was based in part on evidence gleaned from solar eclipse observations. In 1973, a group of scientists chased the total eclipse in a path over Africa in a Concorde jet traveling 1,250 miles per hour, extending the duration of totality to 74 minutes – 10 times longer than can be observed from the ground. The glowing halo around the sun during a total eclipse is called the solar corona, which is the outer atmosphere of the Sun burning at 2 million degrees. Emperor Louis of Bavaria was so terrified by an eclipse in 840 that he died of fright shortly afterword. His three sons fought over who should become Emperor, which ended in the division of Europe into France, Germany and Italy. The last time totality occurred in the continental United States was on February 26, 1979 – nearly 40 years ago. It takes only 90 minutes for the Moon’s shadow to cross the United States, from Oregon all the way to South Carolina. 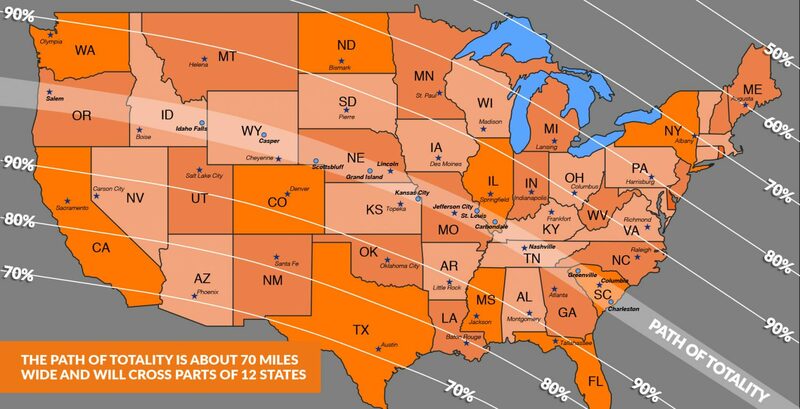 The Path of Totality will cross through parts of 12 states: Oregon, Idaho, Wyoming, Nebraska, Kansas, Missouri, Illinois, Kentucky, Tennessee, Georgia, North Carolina, and South Carolina. The average speed of the Moon’s shadow as it crosses the United States is nearly 1,700 miles per hour – three times faster than the speed of a supersonic jet.